LGD.DD’s Lina Workshop set: Know the player, support the set! This is a piece in simultaneous Chinese and English. Read every other segment for English. Let me know if you really hate this format and I can change it in the future! Presenting the DD Lina Workshop set: Everlasting Heat. Here we’ve also gotten with DD to get his words on his new set, plus some fun questions, as well as his thoughts on the recently concluded D2L Finals in Vegas. Why choose Lina as your Workshop set? DD: Because in pubs, I really love playing high burst ability-spamming casters, Lina has low cooldowns and high damage so I really like using this hero. 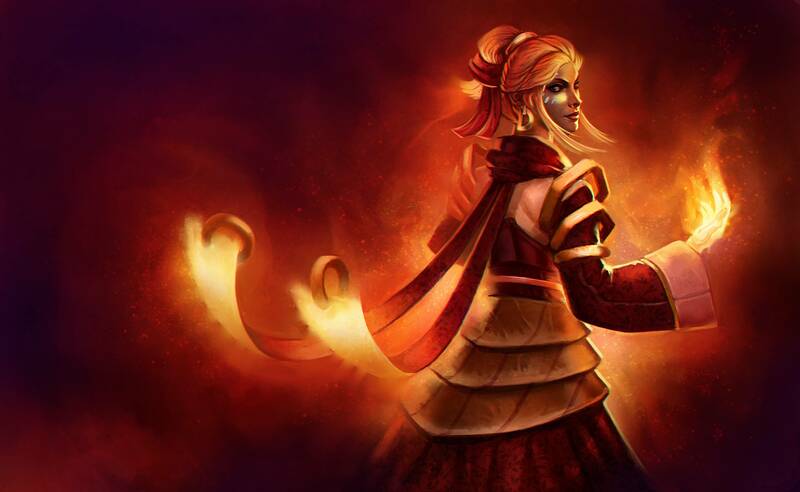 In your own words, why should players look to purchase your Lina set? DD: If you buy my Lina set, your chances of going Beyond Godlike increase exponentially, and you will get 90% of runes as a mid player. Can you tell us a bit about the origins of your ID? DD: My ID is the ID of a high school schoolmate of mine, who was really good at Zhensan. Accomplishment(s) you are most proud of in your career? DD: All the championships I’m pretty proud of. Perhaps the biggest one was the WCG title, because we defeated CCM who were much stronger than us at the time. If you hear a song you like, do you play it on repeat until you’re tired of it, or do you carefully insert it into a playlist to enjoy over time? DD: I just listen to whatever’s on the radio. Do you prefer having a hearty breakfast in the morning, or a savory meal late in the night? DD: I like eating things late in the night..
You often post football (soccer) related topics on your Weibo, what teams do you support? Who do you think can go far in the World Cup this year? DD: I support Germany. I think Belgium can go far. Then do you go outdoors to play some football yourself when you have time? DD: No… I can’t do it anymore. How do you like to play your pub games? DD: Pub games I sometimes play standard, playing to the necessities of whatever role I’m in for that game. If I’m support then I get lane wards up, etc. The other way I play pubs is to try really hard to screw with others, like camping their jungle, or buying boots at start to constantly gank mid. Overall it depends on my mood. You’ve just returned from Las Vegas, and you and your teammates have made a triumphant return in this case, taking the D2L Season 4 title. Share with us some thoughts on this trip? DD: My thoughts about going to Las Vegas are, one should not wear black whilst gambling. Did you spend any time on entertainment in Vegas, what were some things that left an impression? DD: There were two things. One was, we lost our first game in the finals, and right after that our coach berated us silly, and also woke us up in doing so. The other is, every time I played blackjack, I would have 12 points and go for a hit, I’d get a card that put me over. Your Chinese New Year plans? DD: Chinese New Year I’ll spend at home with family, play some singleplayer games, generally just relax and rejuvenate. With the Chinese New Year fast approaching, any wishes for everyone out there? Be sure to head to the Steam Workshop page of the set and give a thumbs up and comment if you like it, show your support!